On Sunday, I shared the terrific Oak Ridge Boys version of Palms of Victory, a.k.a. 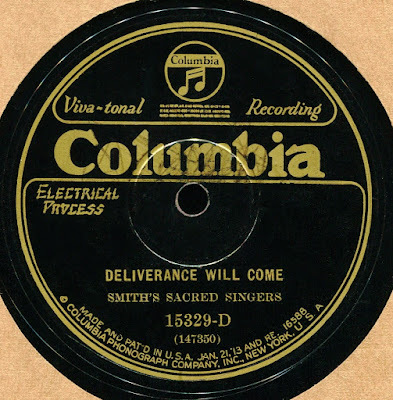 Deliverance Will Come (and vice versa), an 1836 song they wished they'd recorded first. Here's the 1928 version by Smith's Sacred Singers, which the Singers take at about 1/10 the tempo. My copy is quite worn, but I sicced MAGIX's DeNoiser on it, and it hasn't sounded the same since. Why the group whispers the final repeat of the chorus, I know not. The volume dip actually helped my cause--it showed me precisely where it was necessary to cut and boost to maximize detail. Thank you, quiet last chorus repeat. I've also uploaded my restoration of John McCormack's 1914 recording of the Bach-Gounod Ave Maria, featuring Fritz Kreisler on violin and Vincent O'Brien on piano. You'll hear the surface noise taking over at the end! But I think I got a nice file out of it. Found a copy on eBay (or was it discogs?) --I always wanted the 78 to see what I could do with it. The 1958 RCA Camden transfer, while likely superb for its day, doesn't sound quite as good in 2019. I don't know why pianist Vincent O'Brien speeds up a bit during the piano intro. I never noticed this until I made my own rip. Update: I redid the Ave Maria rip a bit--see additional link below. I think I'd left in a little too much hiss in my effort to bring out all the musical detail. My copy is fine shape, but it' a noisy side! Update 2: I also redid Deliverance Will Come, this time with the normal 78 rpm stylus width (2.7 mil). I think the results are a lot better. I posted the new file below. For individual, non-zip files, the Box download button is in the upper r.h. corner, or you can listen at the site! Ave Maria (Bach-Gounod) 3--John McCormack w. Fritz Kreister and Vincent O'Brien, 1914. Thanks for the transfers Lee. The McCormack record is one of my favorites to spin on a wind up Victrola. Even with their sonic limitations, there’s something about acoustically recorded 78s that sound more immediate than many remasters/reissues. Looking forward to these. I loveth a band that playeth the oldies! I continue to be in awe at how much music you coax out of these old sides. Its like archeology. Thank you!